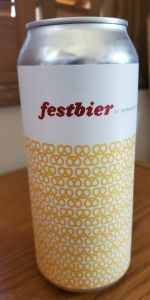 Has some characteristics of a wisn fest beer as well as those of an amber oktoberfest. Nicely done. Flavor is full of toasted grains and light breads. Has some grainy characteristics too. Clean drinking with a crisp moderately dry finish. Refreshing. Clean maltiness. Slight aroma, not much there, really. Some malty aroma, actually hints of kind of a citrus aroma (but just a hint). After it warms a bit, the aroma becomes more prominent, but still not very strong. Golden pale yellow. Only an occasional lonely bubble. White head is creamy-looking, but fades quickly. There seems to be a slight haze. It is absolutely gorgeous looking. The body has a good feel, if a bit flat. Nice malty backbone. Taste is malts balanced by a bit of a tartness. Finish is slightly bitter / tart. Taste is OK, but not really up to the standard. White head with lace. Clear golden yellow color. Not as dark as most Oktoberfest beers. Toasted biscuity malts and grassy, earthy hops. Reminds me a bit more of a maibock than an Oktoberfest. It is a good beer, but seems a bit off style. Very easy drinking example of the style. Maybe too easy. Light toast and biscuit notes, with a slightly spicy and earthy hop finish. Nicely dry overall. The yeast is strong with this one. Very clean lager, some toasted grains and sweeter bready malts too...no caramel as in the amber marzen style, and I'm grateful for that. Some apple and fall orchard notes come in when it hits the tongue. Fairly light, faint spicy earthy hops. Could see drinking big mugs of this. Pale amber color with just over a finger of head that settled to a thin cap. Moderate amount of sticky lacing is left down the glass. Besides the name, this is the first clue that this is a festbier and not a marzen. Aroma of light bready malt with faint spicy hops. Now I read the label further and it says it is a toasty marzen style lager. Well what is it? Definitely not much toast in the flavor as this leans more to the pale, grainy, bready spectrum that is on the dry side. Really clean lager flavor. Nice light body and lively carbonation adds to the festbier character. A good beer despite the confusing label and description. L: Pours brilliant gold with a light orange copper tint under a 1” off-white foam cap that takes 3 minutes to recede to 1/3 its original height. A steady stream of bubbles rises from the bottom of the glass feeding the foam cap. S: Bready, spicy aromas with rich German malt. Very moderate toast, clean fermentation aromas with no esters, no hops, no diacetyl, no DMS. T: A rich malty palate starts slightly sweet and then mid-palate a slight tang with a trace of apple briefly enters leading to a slightly drying finish. Has a complex maltiness with moderate hop bitterness, low to no hop flavor. No caramel to roast flavors, light toast, just a hint of aple that goes away as you drink it. F: Medium body with a very creamy texture, medium carbonation, dry finish, fully attenuated. O: Clean and crisp with rich malt flavors and a dry finish makes for a pretty nice festbier.